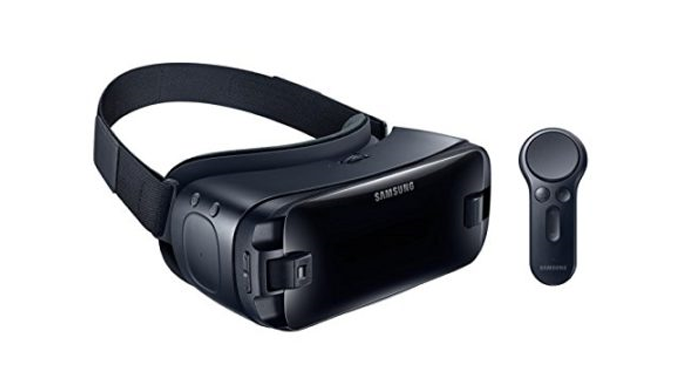 It was presented in September 2014 in a version designed primarily for developers, the Samsung Gear VR headset is now available here in a consumer version, more compact and especially much cheaper. It’s still more expensive than most competing models, but there’s a good reason for that, it uses its sensors, and that makes all the difference. I explain all this in details in my opinion on the Samsung Gear VR virtual reality headset. The Samsung Gear VR looks like a modern but large ski mask. Its design is still rather beautiful, quite clean and I find it, in the end, relatively elegant. We feel the leg of the Korean manufacturer who always offers products with a worked look. It is an elastic headband that keeps it perfectly against our face; we can adjust it to our convenience without any problem using the scratches. For added stability, a second elastic band can be attached to the top of the head. I think it’s better, but those who are afraid of damaging their beautiful hair can easily do without it. For the eye contour, a foam covered with fabric rather pleasant to the touch ensures absolute comfort. She still deserved to be a little thicker, especially at the nose. You can feel an embarrassment at that level fairly quickly. The helmet weighs 318 grams alone, and a little more than 400 grams with my Galaxy S6 placed on the inside. You can, if desired, remove the protective shell to gain a few grams, but quite frankly, the weight is well distributed and ultimately the helmet is very comfortable. We must first know that at Samsung, as always, the products are compatible with each other and only between them. So you can try to tinker to insert your LG or iPhone, you’ll never succeed. Even worse, you need a Samsung Galaxy S6, S6 edge, S6 edge + or Galaxy Note 5, and so the target customer is significantly reduced. Anyway, when you are the proud owner of one of his smartphones, setting up is very simple. A spring clip system holds the mobile very firmly in its place, and small soft inserts are provided to prevent damage to the screen, that’s the least. It is impossible to wear glasses with the Samsung Gear headset, but you can adjust the sharpness with precision thanks to the wheel located on the top, and which allows distancing the smartphone from the lenses. Almost everyone will be able to use the helmet. Nevertheless, we regret not being able to adjust the spacing of the lenses, nor the depth. 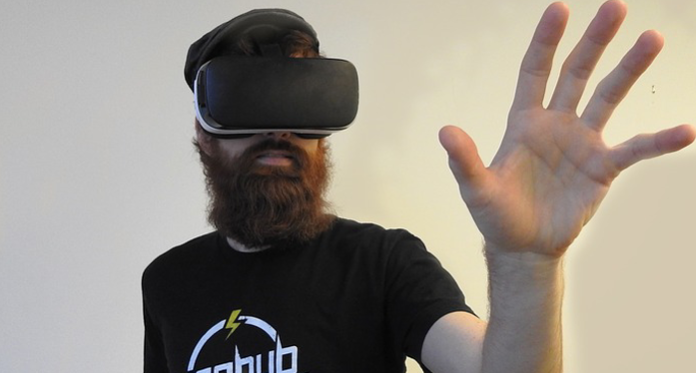 However, it is common on much cheaper models such as Tera VR Box for example, and it allows to adapt the headset to all users. Some complaint of having the impression of squinting or having the lenses too close to the eyes. This is not my case, fortunately, but it’s a shame not to be able to adjust the glasses better. Samsung placed a touchpad and a “back” button on the right side of the headset (you had to be not left handed). They allow you to walk around the application library quickly, but will also be used for certain games and video management. It’s not great regarding manipulation, but it’s still relatively accurate. Finally, a little more in front of the headset, you find two other control keys, which serve only to change the volume. Notice virtual reality headset Vr Overall, the grip is quite good, and the headset is rather intuitive. In less than an hour, I was not thinking about manipulation at all. Regarding the connection, we find under the headset a micro-USB input, which is used to charge the Samsung Gear VR. However, it is not possible, under any circumstances, to download files directly to the headset. After walking around the outside of the helmet and its controls, we install it on our heads, and we were finally going to have a little fun. Just launched the first 360 videos, the first word that comes out of my mouth is: Wow! The immersion is bluffing, and one immediately feels that the quality of the sensors of the helmet is much superior to the models using the gyroscope and the accelerometer of the smartphones. The fluidity is optimal. This is the only headset that does not give me a feeling of fatigue after 30 or 40 minutes of use, it feels like the headset reacts correctly, and our brain is not completely confused. Regarding the image quality, I have not seen better when I write this review (beginning of 2016). Of course, we still note a little pixel grid effect on the videos, but we will have to wait for more great screens to hope better. Anyway, it’s already excellent, and I can distinguish all the details of Remy Lacroix’s buttocks without any problem, which is pure bliss. A word for games, even if it’s not my main passion, sometimes I change my activity. The quality is even better, and there are dedicated games on the store Oculus Store are a bit expensive but frankly lovely. For now, the library is small, but it should quickly gain depth. This is the headset that I use every day, or almost. And I’m thrilled, it’s probably the best at the moment, and so the price of € 99 is entirely justified. Exit the latencies, and the problems of headaches that result, here fluidity is the keyword. If you have a compatible smartphone, then go for it, you will not regret it. For those who have just bought the latest LG, iPhone or Nexus, then actually it will be too much investment, and it is better to turn to more affordable headsets that accept all smartphones, such as Homido VR for example. Therefore grab salinger sued and some friends and let’s play poker! Folks see me coming towards table, they are the intimidation factor. Undeniably believe thjat whifh you said. Your favorite reason seemed to be on the net the simplest thing to be awarre of. I say to you, I definitely gett annoyed while people think about worries that they plainly don’t know about. Your good feeling immediate influence everyone who come in contact with you. The information on the Warcraft blueprint has nothing to use hacking or cheating. Another benefit of playing online is you could play without money in case you choose. It will be the most straightforward details that must definitely be checked and double checked to insure the guest has an experience that just isn’t just pleasing, but many importantly, extraordinary. calls or physical location visits. There’s something that every business desires to accomplish having its website: leveraging it to create more growth. now this is quite very important. Live casino games, like live roulette, live blackjack, and live baccarat, are for sale to be played from the comfort of your house in the present gambling market. Hi there, You have performed a fantastic job. I will certainly digg it and personally suggest to my friends. I’m sure they will be benefited from this site. At my current startup I’ve seen a variety of requests… on the pizza delivery guy letting us know he was in front door to potential investors looking to talk with the management team. your startup dependant on the type of request the viewer selects. Ensure that you build redundancies so contact requests (important ones!) don’t explore a single recipient’s inbox. trigger automatic replies to call requests with information which may solve their problem. This ‘s all quite simple to arrange with all-in-one marketing platforms like HubSpot. Some truly great info, Gladiolus I found this. Thank you for every other great post. The place else could anyone get that type of information in such an ideal way of writing? Great article. Keep on working, good job! Great job! Very good review. Thank you very much. Hello colleagues, how is everything, and what you desire to say about this article, in my view its truly amazing designed for me. After looking at a handful of the articles on your web site, I seriously appreciate your way of writing a blog. nobody else realize such detailed about my trouble. you ought to write more about this issue, it might not be a taboo matter but usually people do not speak about such issues.